The movie is a searing indictment of the Pentagon’s business-as-usual attitude that too often lurks behind the deaths of the young men and women wearing their nation’s military uniforms. In this case, 132 deaths aboard both the Navy’s MH-53E minesweeping chopper and its near-identical twin, the Marines’ troop-and-cargo carrying CH-53E. The film makes clear that Van Dorn and more than 100 others made the ultimate sacrifice for what the Pentagon itself conceded in 2015 was an “appalling state of readiness.” Among other problems, frayed wires, flammable fuel lines, and flawed bearings had made the chopper too dangerous to fly. “It was a failure of leadership. It was a failure of maintenance. It was a failure of operations,” Navy Captain Todd Flannery, an MH-53 commander, told Virginian-Pilot reporter Mike Hixenbaugh in the fall of 2013. As the military tried to keep its choppers airborne on the front lines over Afghanistan and Iraq, it short-changed those flying back home. Meanwhile, Van Dorn would keep piloting his ailing aircraft until he perished, along with two others, several months after Flannery’s statement. When I wrote about a similar rash of helicopter crashes 35 years ago, the Army was already moving beyond its Vietnam-era AH-1 Cobras and UH-1 Huey helicopters to a new generation of UH-60 Black Hawks and AH-64 Apaches. To their credit, Army leaders took action in the wake of that investigation. They appointed a blue-ribbon panel, which led to the grounding of hundreds of helicopters, and ordered a fix that has all but eliminated the deadly problem that had killed nearly 250 troops. But the Marines, in their relentless push to remain relevant and keep the hopes of a glorious replay of an amphibious assault alive, have doubled down: instead of buying new, safer choppers, they’re simply replacing their CH-53Es with beefier CH-53Ks, and hoping history doesn’t repeat itself when it comes to crashes. In addition to this new class of H-53s (the Marines got their first one in May, and a second is due in early 2019), there are two kinds of H-53s still flying: the Marines’ cargo-carrying CH-53E Super Stallions (capable of carrying 55 troops) and the Navy’s minesweeping MH-53E Sea Dragon. Historically, the Navy’s MH-53Es have been crashing at a rate about three times the service average (the Navy recently has stopped providing such information on its website). The Marines plan to keep their CH-53Es flying until at least 2030. The new CH-53K King Stallion boasts three 7,500 horsepower engines and a so-called fly-by-wire “glass cockpit,” and is capable of cruising at 172 miles an hour. It’s the Pentagon’s biggest (99 feet long) and heaviest (44 tons fully loaded) helicopter. Its drive train, which sends the engines’ power to the rotor blades, weighs more, by itself, than one of the Army’s medium-lift UH-60 Black Hawk choppers. Able to ferry nearly 14 tons of Marines or the armor needed to protect them, the Marines say the CH-53K is critical to their ability to storm enemy shores. “The new heavy lifter will allow the U.S. Marine Corps and international militaries to move troops and equipment from ship to shore, and to higher altitude terrain, more quickly and effectively than ever before,” says Sikorsky, which since 2015 has been part of Lockheed Martin, the Pentagon’s number-one supplier. “I am very proud of the work accomplished to deliver the most powerful helicopter ever designed into the hands of our Marines,” Lieutenant General Steven Rudder, the Marines’ top pilot, said in May when the Corps received its first CH-53K. The Marines have long feared becoming simply a smaller version of the Army. Those concerns have grown since 9/11, when the Marines fought far from any shoreline in Afghanistan and Iraq (although Marines have argued that their initial foray into Afghanistan in 2001 was an amphibious operation). The Corps fears, despite its backing on Capitol Hill, that blurring the distinction between the 485,000-strong Army and the 186,000-strong Marines could imperil the storied fighting force. The idea of storming enemy beaches warms the hearts of Marines. “The United States has not conducted such a landing in more than half a century, although it has had opportunities to do so,” the green-eyeshade brigade at the Congressional Budget Office pointed out in 2006 (and nothing has changed in the 12 years since). “Highly accurate missiles can now hit ships and landing craft while they are still hundreds of miles from shore, making it far too dangerous for Marines to storm a beach with their current capabilities,” The National Interest reported earlier this year. Yet the Marines are sticking with the mission, pumping tens of billions into the CH-53K and exploring costly new ways to keep themselves in the war-fighting game (including fleets of drones, barges and unmanned subs). The Pentagon has long favored buying new weapons over keeping old ones operating safely. This tendency was exacerbated in the Marine Corps, where senior officers have been skittish ever since Defense Secretary Robert Gates had the temerity to wonder aloud about their reason for being in 2010. “Looking ahead, I do think it is proper to ask whether large-scale amphibious assault landings along the lines of Inchon are feasible,” he said, citing the 1950 Marine-led invasion that tilted the Korean War in favor of the U.S. and its UN allies. The next year, Gates killed the Marines’ so-called “swimming tank”—the Expeditionary Fighting Vehicle—but only after taxpayers had been soaked for $3 billion. The CH-53K—another key in any Marine amphibious assault—is projected to cost ten times as much. It now has an estimated price tag of $31 billion for 200 copies—an eye-watering $156 million each. In development since 2006, the CH-53Ks were originally slated to begin operational service in 2015, but that date has slipped to late next year. There are storm clouds on the horizon about future schedule slips, which inexorably would drive up its eventual cost. The growing price of the helicopter is likely to make officers leery of sending it into harm’s way. Cautious commanders might prefer to keep costly airframes protected by dropping Marines where it’s relatively safe and forcing them to hike into combat. The CH-53K program has followed a familiar and vexing Pentagon procurement path. In its most recent assessment, issued in late 2017, the Pentagon’s testing office noted that its blueprints were still in flux—despite being under development for more than a decade, and a derivative of a helicopter that has been flying since the 1960s. Beyond that, its flight-test plan was only 10 percent complete and slipping “due to technical problems discovered during testing.” And—replicating what the Corps did with its F-35B fighter—the Marines plan to declare the aircraft operational before its initial operational test and evaluation is finished. Critical “air survivability equipment” won’t be ready when the CH-53Ks begin flying operational missions. The Navy, which is in charge of buying Marine aircraft, plans to “retrofit it to the fleet as it becomes available.” (So much for the Marines’ perpetual claim that they take all necessary steps to keep their young troops as safe as possible. Another clue that they’re skimping: while the Army was spending $1.2 million—and 6,000 hours of wrench-turning—to bring each of its choppers up to snuff after punishing tours in the Middle East, the Marines spent only $100,000 and 935 hours doing the same for their CH-53Es). 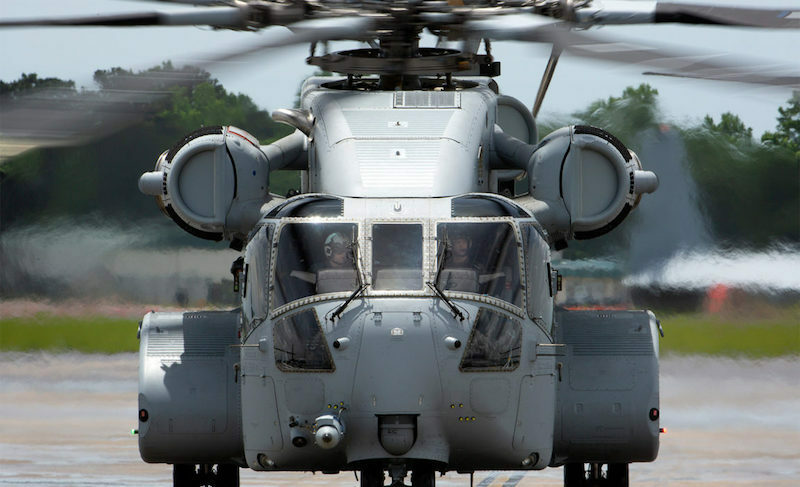 While Sikorsky built the first four CH-53K test choppers in Florida, it decided to move production to Sikorsky’s home plant in Connecticut after several states competed to land the prize. Connecticut snared it in 2016 with a $220 million package of taxpayer-funded grants and tax breaks to Lockheed Martin. The deal includes $140 million from Connecticut to Sikorsky that Hartford will borrow at an estimated cost of $30 million in interest. Connecticut lawmakers approved the deal by a margin of 171 to 7; two weeks later Sikorsky’s unionized workforce voted 2,104 to 140 in favor of contract concessions sought by Sikorsky to keep their jobs in Connecticut (the average job at Sikorsky paid $94,000 in 2016). Lockheed had warned Connecticut that building the choppers in the Nutmeg State would cost the company $400 million more than in other states seeking the deal, which included Florida, Georgia, South Carolina and Texas. So, Connecticut coughed up the cash, borrowed or otherwise, to seal the deal. The program “is expected to pump an estimated $69.2 billion into the state’s economy” through 2032. It’s just too bad that so much of that money is going to an antiquated, all-but-obsolete mission. And that too much of it is going to pay for shiny new aircraft rolling off the production line and into the air, while too little is likely to be spent on keeping them flying safely after take-off.